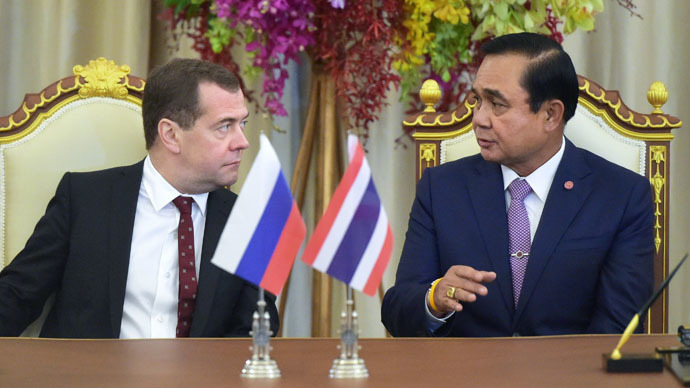 Thailand has confirmed it’s interested in creating a free trade zone with the Russia-led Eurasian Economic Union (EEU) and is expected to submit an application by the year end, according to Russian Trade and Industry Minister Denis Manturov. "We are waiting for a final application from our colleagues, which should be sent to the Eurasian Economic Commission (EEC), so that the Russian Federation could take part in the concrete discussions," Manturov told reporters Wednesday after a meeting of the joint Russian-Thai commission on bilateral cooperation. He said there could be separate decisions on "sensitive areas" like the car industry which were reached during the deal with Vietnam. Everything depends on the readiness of Thailand, which has already confirmed its interest and is working on the final format of the agreement, according to the minister. In May Vietnam signed a free trade zone agreement with the EEU economic block. It became the first free trade zone agreement between the EEU and a third party. Russian Prime Minister Dmitry Medvedev then said the EEU will sign free trade zone agreements with other countries, specifying that almost 40 countries were already holding talks with the EEU. He added that Russia was also working on a possible future currency union with other members of the Eurasian Economic Union. India started negotiations over the free trade zone agreement with the bloc and signed a framework agreement at the International Economic Forum in St. Petersburg last month. The EEU plans to offer cross-border stock trading in 2016, Eurasian Economic Commission Minister Timur Suleimenov said in June. The Eurasian Economic Union was started in 2015 based on the Customs Union of Russia, Kazakhstan and Belarus. In 2014 Armenia joined the bloc. On Monday Russian President Vladimir Putin signed a law ratifying Kyrgyzstan accession to the EEU. The economic block is designed to ensure the free movement of goods, services, capital and workforce within its borders.